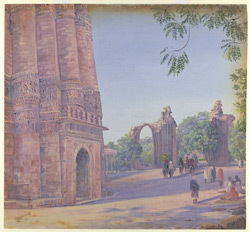 Oil painting on paper of the Qutb Minar at Delhi by Marianne North (1830-1890), dated November 1878. The Qutb Minar was originally built as a tower of victory but also doubled as a minaret; used by the Muezzin to summon the faithful to prayer. Started by Qutb-ud-Din, who built the first storey, the tower consists of five storeys and at 238ft is 80ft higher than Nelson's Column in Trafalgar Square, London. The two highest storeys were rebuilt in 1368 by Firuz Shah Tughluq, who also added a cupola. Damaged by earthquakes in 1782 and 1803, it was restored by Major Robert Smith of the Bengal Engineers in 1828. Marianne North visited India in 1877-79 and completed over 200 paintings whilst there. She wrote in Volume II of 'Recollections of a Happy Life' (1892), "I...settled myself in the bungalow which had been made in one of the old gate-towers, under the shade of the Kutab, the highest tower in the world...which reminded me of the American sequoias...It has the same swell at the base, the same gradual tapering to the top, and I thnk it is one of the few buildings which really looks its full size."